Apart from Harleyford and Marlow, Thames locations with which I have a close personal association, Reading features unusually heavily in my book, All Along the River; Tales From the Thames. Here is a little extract. Copy from the book is in black, blog additions are in red. I should point out that none of the pics used here appear in the book. Oh, and they were all taken by my partner and photographer, Rob…alias Dr Bob Conolly. By the way, it will surprise some people that much of the information relating to Reading is about food. Yes indeed! Not necessarily GOOD food mind! Reading is often dubbed ‘Dreading’ by its disaffected youth. Jerome K. Jerome [author of Three Men in a Boat] must have shared their view as he famously wrote, ‘One does not linger in the neighbourhood of Reading.’ Rob and I linger in it surprisingly often; not because we love the place or are detained against our will, like Oscar Wilde at Reading Gaol, but because we cannot find our way out. Do bored teenagers amuse themselves by removing and swapping street signs? AND DID ONE OF THOSE YOUNG PEOPLE NICK A PUB SIGN WHILE BACK-PACKING AROUND AUSTRALIA?? 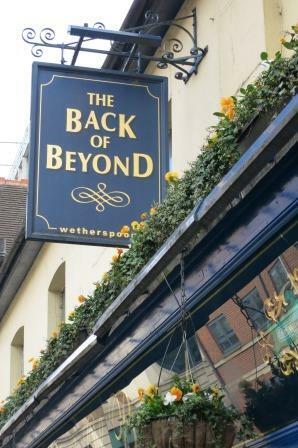 This Pub conjures outback Oz but is oddly fitting for Reading! Reading was little more than a village in the 18th century, but the story of Stephen Duck suggests it had already developed the ability to confound travellers. Duck was a plough-boy poet from Wiltshire, and in 1729 his verses on the wonders of nature brought him to the attention of Queen Caroline. He was summoned to Windsor Castle, where he became royal librarian and married the Queen’s housekeeper. Duck began to write sophisticated poetry to match his lifestyle, but it was rejected by the public. In 1756, he set off for his old home in Wiltshire hoping to find inspiration in his childhood surroundings. Sadly, he got no further than Reading where, either from depression or the inability to find the road leading west, he drowned himself in a stream behind the Black Horse Inn. It appears even Reading’s own inhabitants find it difficult to get a handle on the town. On our first visit we asked a young waiter for directions to the abbey ruins. He looked astonished and replied: ‘I didn’t know we had an abbey!’ Fortunately a lady at the next table overheard and put us on the right track. 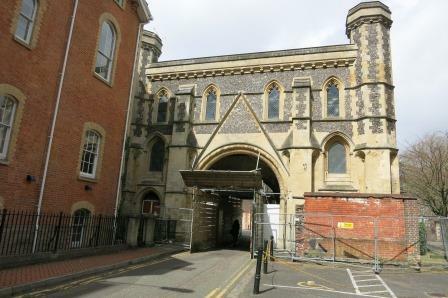 TO BE FAIR TO THE WAITER, ONLY THE GATEHOUSE OF THE ABBEY REMAINS. DUE TO REPAIR WORK IT RESEMBLED A GIANT TRAPDOOR ON OUR LAST VISIT. WE WERE AFRAID TO VENTURE IN , LEST WE REALLY DID REMAIN IN READING FOREVER! Abandon all hope, ye who enter in!! She also told us where to find the museum, Reading Gaol, the Post Office, and the lion statue in Forbury gardens. I tried to persuade her to spend the day with us but she was on her lunch break from a local bank. 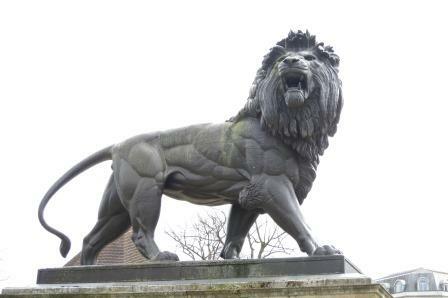 NB – WE FOUND THE LION STATUE…..CAN ANYONE GUESS WHY IT IS CLASSED AS A LITTLE STRANGE? AND WHY IT IS LOCATED IN A READING PARK RATHER THAN IN TRAFALGAR SQUARE, FOR WHICH IT WAS ORIGINALLY INTENDED? DON’T FORGET TO COMPLETE THE ANTI SPAM SUM BELOW THE COMMENT BOX!!! IT”S VERY SIMPLE, HONESTLY. What is wrong with this seemingly magnificent lion? TAKE A THERMOS FLASK AND A COMPASS DEAR VIKKI! AND SOME WATER FOR ALBIE!